Description of "Organic Food Marketing in Urban Centres of India"
Organic food is poised to take deeper root in urban India. A great diversity of organic initiatives exists in the country, ranging from long-standing farmer-centric initiatives to more recent domestic organic brands. Supply chain models and retail formats are equally diverse and include small organic stores, supermarkets, community-supported agriculture, restaurants and e-commerce. Organic Food Marketing in Urban Centres of India is a valuable resource for organic manufacturers, retailers, policy makers and researchers. It is also of great practical use to the average urban citizen interested in consuming sustainably. This work is the result of a collaboration between the Humboldt University Berlin, Germany and the International Competence Centre for Organic Agriculture (ICCOA), Bangalore. Case of Hyderabad, India. She directed the present study on urban market structures as a Research Associate at the Humboldt University Berlin in the Indo-German cooperation project Sustainable Hyderabad. Manoj Kumar Menon holds a degree in Agricultural Sciences and did his Post-graduation in Management (MBA from FMS, University of Delhi). He has been the Executive Director of ICCOA since 2006. He has worked in the organic agriculture sector in many parts of India, and actively participates and advises policy formulation in some state governments. He was also a co-author of the previous research study The Market for Organic Foods in India: Consumer Perceptions and Market Potential, published by ICCOA in 2006. 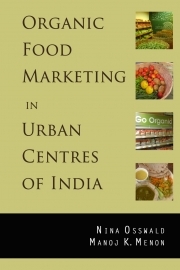 Reviews of "Organic Food Marketing in Urban Centres of India"